Inspiration for this tree has come from rural N.Z. I remember seeing trees similar to this standing alone on farms in the "King County" region and has been styled accordingly. Was styled approx 6 months ago and originally had lower branches that extended from both sides of the trunk. Realizing it spoiled the look (and was against basic Bonsai rules) it was removed to create the current look. Styled by clipping only, there has been no wiring applied to this tree at any stage. I've used 2 rocks in an attempt to create a natural setting. Been styling Bonsai for a little over 12 months now so still very new at it. Would appreciate honest feed back so that I may improve my skill set. Waldo. DO you mean the page with the coprosma? Or this site in general? Flick me your email and I can send you the photo. Your Inite should be fine, had a quick look online. Did one a couple of years ago (coprosma tequila sunrise - looks v similar). Shaped it first, most of it died off but saved it and turned into a cool looking Bonsai. THEN re-potted. Prob best to shape now and then transfer to pot in spring otherwise 2 big shocks for the plant at one time is harder for it to handle. Can be done but much higher risk tree wont survive. Help is on the way now. These are real easy to look after. I've learned a lot about them since 1st using as Bonsai. Coprosmas are great as Bonsai as you can chop heaps of roots off without too much trouble (just don't go too crazy is all), but around 75 - 80% in one go should be OK.
Leave the soil in tact on the roots that are left on the tree without disturbing it. Use fine porous gravel or pumice chip as soil. trim the root ball so the gap in the pot for the new 'soil' is approx 20mm all around and at the bottom. Do this and the tree should be mint. Best time to d it is spring when things are starting to grow (includes roots). I say all this assuming the v use mentioned is similar to this. Is this Tree hard to Maintain ? Kindly advise, I am going Buy a Coprosma Ignit. 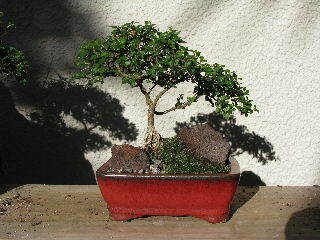 please give me your experience on this Bonsai tree. (It will be from a Nursery in a normal ^ inch Pot,) I intend to trim it and then transfer the tree direct into a Bonsai Container!! I am about to order a dish to start my 8" un-clipped Coprosma....what size dish are you using in the picture of your lovely Coprosma? Yes was deliberate - just wondered if a little OVER exposed. Many NZ natives hate having their roots tampered with, wasn't sure about this species so used bigger pot for now in interests of tree health. The tree will increase in size slightly over time - however I intend to reduce the pot/root system over time and as the tree adjusts. Thanks for contributing. I like the shape of the tree. The roots being exposed I thought was intentional and adds to the tree. I feel if it was covered it would not have a nice balance with the pot since the pot is a little big. But the composition is great.